Happy Almost Mardi Gras! Every January 6th kicks off the official King Cake season and Carnival. 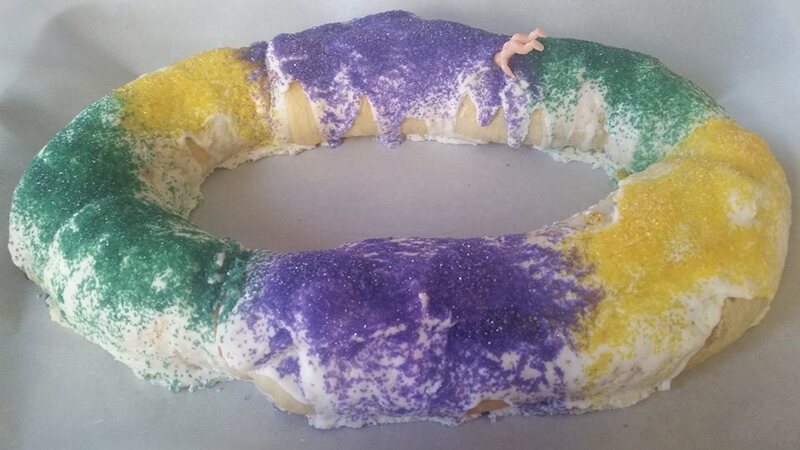 I wrote a guest post, ‘Tis the season of King Cakes, over at Charlotte Riggle’s blog for all you food and culture buffs. 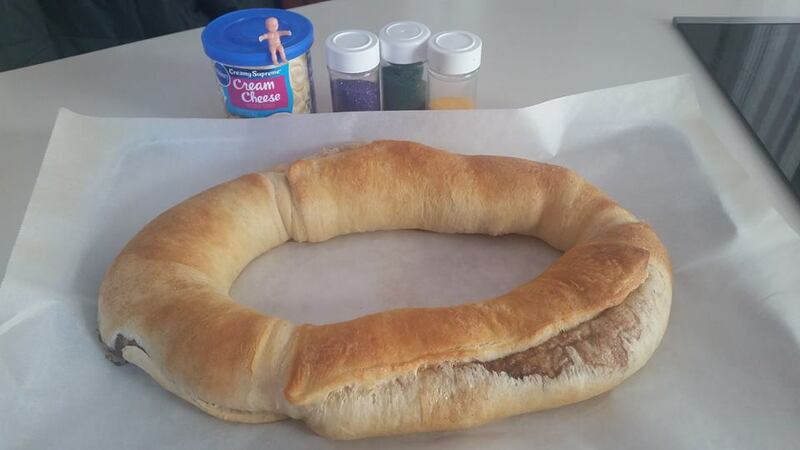 Today I want to share another easy King Cake recipe. 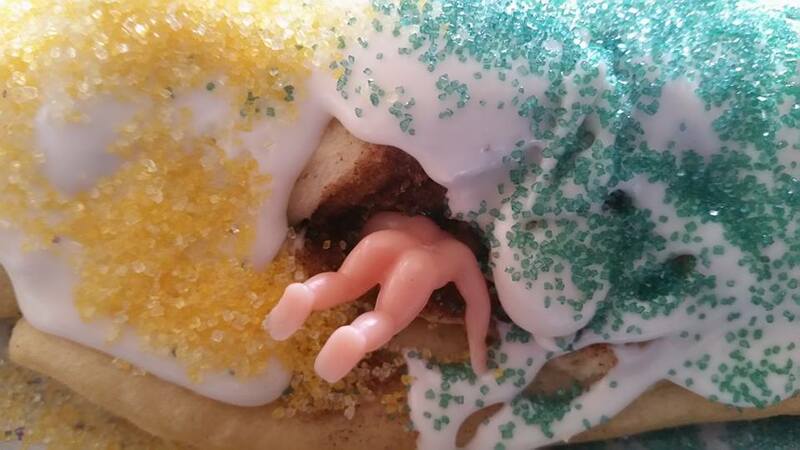 The recipe in my book, THE KING CAKE BABY, uses frozen bread dough with a cinnamon-sugar filling and includes a recipe for making a Cream Cheese icing. In this recipe, I use three Pillsbury Crescent Dough Sheets, the cinnamon-sugar mix, and a can of Pillsbury Cream Cheese icing. Easy peasy! The only thing easier than making this King Cake is picking one up at your favorite grocery or bakery. Cover a baking pan with parchment paper or use a nonstick cookie sheet. 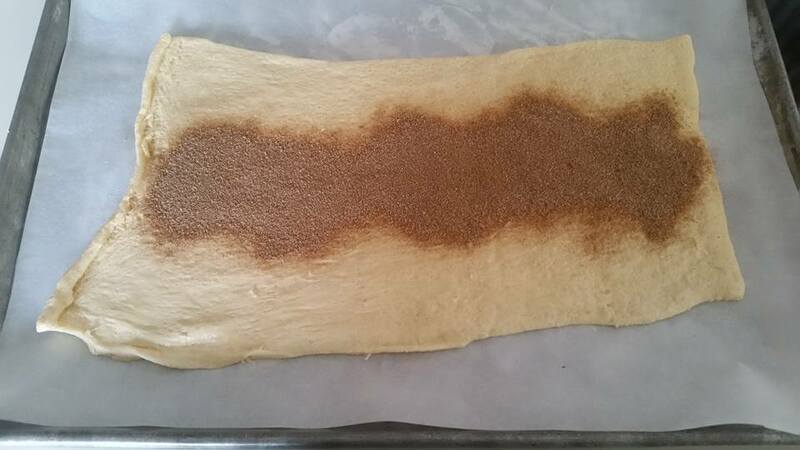 Unroll dough sheets and sprinkle each with about a tablespoon of the cinnamon-sugar mix. 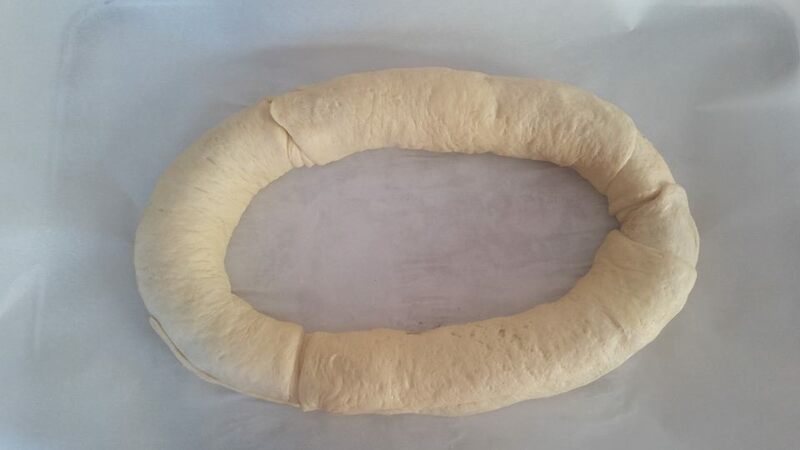 Roll each dough sheet from the shortest side of the rectangle. Arrange into an oval shape. Press seams together to connect. Bake according to directions on Pillsbury package. EDIT: Add an extra 5 or 10 minutes depending on your oven. Check to make sure the inside is done. Soften ½ can of Pillsbury Cream Cheese icing. Have purple, green, gold sprinkles handy. While the cake is still warm, pour icing on top. Alternate with purple, green and gold colored Mardi Gras sprinkles. Hide a plastic King Cake Baby in the underside of the cake. Before eating, check to see if you got the baby! 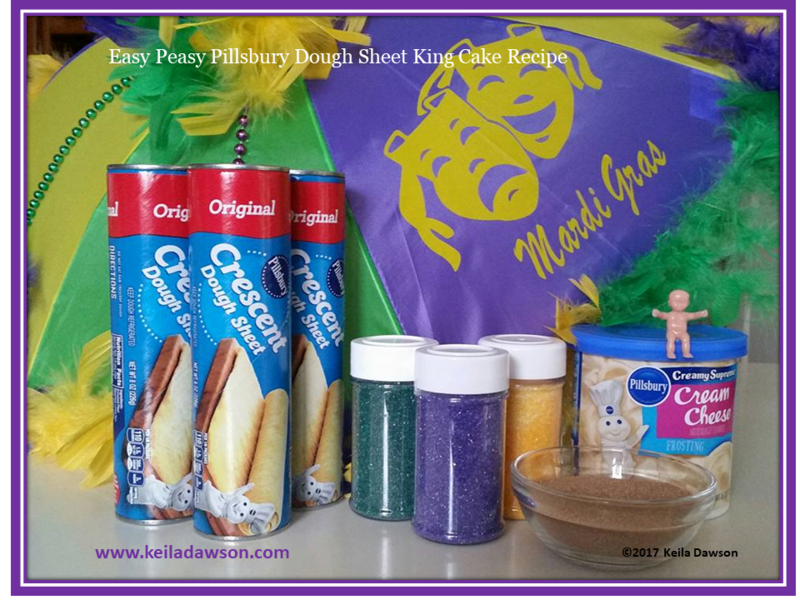 Click Mardi Gras King Cake from Pillsbury Dough Sheets to download the recipe. And if any of you need a gluten free recipe, see this Red Mill cinnamon roll recipe. Made this as a king cake alternative as I live in Florida, and the king cakes available to me are…gross. It is good, but I found that the inside was not cooked all the way through. Oh no! Sorry that happened. Guess it needed an extra 5 minutes? The recipe in my book calls for frozen dough, that’s yummy too. I bake to package directions, but if you leave it in longer, definitely top with foil so the top won’t brown too much. Happy Mardi Gras! Great idea and easy recipe. I’ll try it this year. Thank you! Welcome. It’s so easy and yummy too! I may try your recipe. Looks easy and yummy. It is! 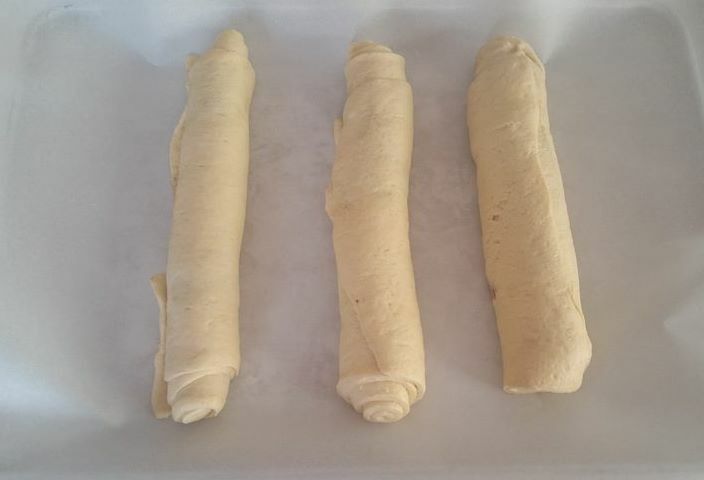 I’ve seen the recipe with the regular crescent rolls, but using the sheets makes rolling way easier. Hope you enjoy!